Background: Little is known of hospital practice in brain death determination, specialty involvement, and followed procedures, including the apnea test. Methods: We reviewed 228 patients pronounced brain dead at Mayo Clinic from 1996 to 2007. We performed a detailed review of clinical determination of brain death, intensive care support, apnea test procedure, and complications. Results: There were 228 patients who were pronounced brain dead, mostly after traumatic brain injury, cerebral hematoma, or aneurysmal subarachnoid hemorrhage. Brain death was declared within 24 hours of ictus in 30% of the patients and within 3 days in 62%. All patients were using one or more vasopressors, and 61% of the patients received vasopressin for diabetes insipidus. An apnea test could not be performed in 7% of the patients because of hemodynamic instability or poor oxygenation at baseline. In 3% of the patients, the apnea test procedure was aborted because of hypoxemia or hypotension. No major complications (cardiac arrest or pneumothorax) occurred during the apnea test. Polytrauma resulting in brain death was significantly more common in patients with aborted or not attempted apnea tests than in patients with completed apnea tests (p = 0.0004). During the study epoch, we found a shift toward determination of the tests by neurointensivists, pediatric neurologists, and neurosurgeons. Conclusions: Brain death declaration is frequent within the first 3 days of admission. It is usually performed in hemodynamically unstable patients requiring vasopressors and vasopressin. If preconditions are met, apnea testing using an oxygen-diffusion technique is safe. However, in 1 of 10 patients, an apnea test could not be completed and confirmatory tests were needed. No appreciable function of the brain and brainstem constitutes brain death—a credible and practically useful designation for this condition.1 The emergence of brain death in a patient with a catastrophic brain injury is uncommon, and surveys have indicated that only 5% to 10% of all comatose patients admitted to intensive care units (ICUs) become brain dead.1–3 The appearance of total flaccidity, absent cough to tracheal suctioning, breathing at ventilator rate, sudden hypotension, invariant heart rate, profound diuresis in a patient with fixed pupils, and no corneal and oculovestibular reflexes are clinical indicators. The declaration of brain death is a major responsibility for physicians, often performed by those who are staffing or consulting in ICUs. In 1995, the clinical determination of brain death was described in an evidence-based practice guideline.4 This document has been adopted by organ procurement agencies in the United States and elsewhere. However, since this comprehensive guideline became known, studies have largely focused on specific neurologic manifestations or type of confirmatory tests.5–7 No detailed studies as yet have been published on actual hospital practice in a large number of patients pronounced brain dead. A review could identify concerns in key areas such as correctly followed procedures, physician involvement, and apnea testing. In this analysis, we present a single (tertiary) center experience with 228 brain death determinations. Hospital policy requires contacting an organ procurement organization when clinical examination shows evidence of loss of all brain function, but also when rapid progressive loss of brain function is anticipated. These contacts are typically initiated by ICU nursing staff. Patients identified for this study were therefore retrieved from a database maintained by our organ procurement organization (LIFESOURCE). In both Mayo-affiliated hospitals, the detailed guidelines of the American Academy of Neurology (AAN) are readily available for consultations to physicians performing a brain death examination and the apnea test. The study was approved by the institutional review board. Two of the authors (E.F.M.W. and A.A.R.) reviewed full medical records of 236 patients considered brain dead from 1996 to 2007. We excluded 8 patients who were referred to LIFESOURCE but, at the request of the family, had support withdrawn before a full neurologic assessment could be completed (4 patients within 24 hours, 4 patients within 6 days of admission). In the remaining 228 patients, demographics, cause of catastrophic injury, time from admission to brain death, specialty of physician determining brain death, findings on neurologic examination, and details on the apnea test were reviewed. Findings on chest x-rays were collected. Laboratory data with changes in pH, arterial Pco2, and arterial Po2 during apnea testing were obtained (in patients with two apnea tests, mostly children, we entered the first apnea test values). Hypotension was defined as a new blood pressure decrease to less than 90 mm Hg systolic; hypoxemia was defined as arterial Po2 less than 60 mm Hg or a pulse oximeter reading of less than 90%. Diabetes insipidus was diagnosed as sudden polyuria with hypernatremia, decreased specific gravity, or osmolality. According to protocol, apnea testing was performed using an oxygen-diffusion technique.4 As described before, minute ventilation was adjusted, and preoxygenation with 100% oxygen for 10 minutes preceded disconnection from the ventilator.4,8 The aim was to normalize arterial Pco2 and increase arterial Po2. The apnea test was aborted when progressive hypotension or hypoxemia occurred in the minutes after disconnection. Repeat blood gasses were obtained after 8 to 10 minutes of disconnection to document either a 20-mm Hg increase in Paco2 from a normal baseline or a target value of at least 60 mm Hg. Statistical analysis using a two-tailed Student t test was performed to compare pre– and post–apnea test data measurements. A significant difference was determined to be present for p < 0.05. During the 12-year study period, 228 patients were pronounced brain dead. There were 195 adults and 33 children (aged <18 years). The age ranged from 2 months to 84 years (median 46 years). 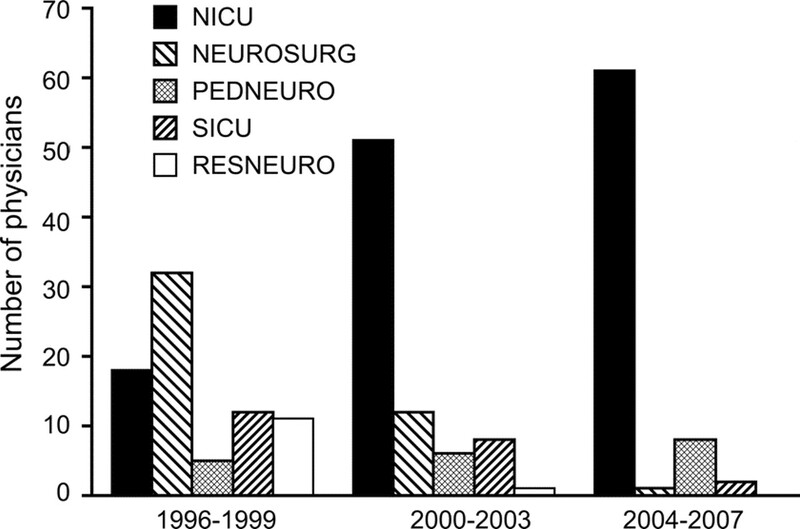 Seventy-six patients (33%) were admitted outside the Neurosciences ICU (Trauma ICU, Coronary Care Unit, Cardiovascular ICU, Transplant Unit, and Pediatric ICU) Brain death determinations were consistent across 4-year epochs (1996–1999, n = 78; 2000–2003, n = 78; 2004–2007, n = 72). The cause of brain death was traumatic brain injury (32%), intracerebral hematoma or aneurysmal subarachnoid hemorrhage (39%), anoxic injury (11%), ischemic stroke with brain swelling (8%), or miscellaneous causes (10%; brain tumor, CNS infection, brain edema and fulminant hepatic failure, acute hydrocephalus, and battering). In 13 patients (6%), emergency craniotomy was performed to remove a tumor or subdural or cerebellar hematoma. After admission, brain death could be declared within 24 hours in 69 patients (30%), between 1 and 2 days in 47 patients (21%), between 2 and 3 days in 26 patients (11%), and after 3 days in 86 patients (38%). At the time of diagnosis of brain death, all patients became hypotensive and required one or more vasopressors or inotropes. Diabetes insipidus was diagnosed in 141 patients (61%) and treated with vasopressin. Hypernatremia (146–170 mmol/L) was observed in 46 patients (20%). Pulmonary injury was apparent in 51 patients (22%). It consisted of pneumothorax requiring chest tubes in 23 patients, diffuse pulmonary edema in 20 patients, and lobar infiltrates in 8 patients. Clinical examination and apnea test. Neurointensivists and neurosurgeons more commonly declared patients brain death, but during the 12 years of the study, there was a notable increase in the number of neurointensivists performing the entire procedure of brain death declaration (figure 1). The neurologic examination and apnea test closely followed the AAN guidelines, and documentation included exclusion of confounders (hypothermia, sedative drugs, acid–base disturbances, or neuromuscular junction blockers), review of neuroimaging, and details of physical examination, including lack of response to noxious stimuli documentation and absence of at least pupillary, cornea, oculovestibular, and cough reflexes followed by an apnea test. In four patients, brief flexion of arm and fingers was observed, and in one patient, subtle head turning was noted, and these were interpreted as spinal reflexes4 (confirmatory tests in these five patients showed absent intracranial blood flow or electroencephalographic silence). Examinations were repeated in children after a 12- to 24-hour interval as per protocol, followed by a confirmatory test. Neurointensivists (NICU), staff neurosurgeon or chief resident (NEUROSURG), pediatric neurologist (PEDNEURO), surgical intensivist (SICU), neurology chief resident (RESNEURO). Apnea tests were initiated only after brainstem reflexes were absent. Disconnection from the ventilator documented a normal breathing drive in 2 patients, but repeat apnea testing 12 hours and 3 days later resulted in documentation of apnea. Apnea testing was not attempted in 16 patients (7%). The reason for not proceeding with an apnea test was inability to maintain a stable blood pressure (n = 6), high positive end-expiratory pressure requirements (more than 15 cm H2O), or refractory hypoxemia (n = 10) despite a pretest oxygenation trial using a fraction of inspired oxygen of 1 for 10 minutes. An apnea test was performed with placement of an endotracheal suction catheter providing 6 to 10 L of oxygen. In three instances, an anesthesia bag with 100% oxygen and an open valve for 5 minutes’ duration was used, and in one patient a T piece with a continuous positive airway pressure valve of 15 cm H2O was used. An apnea test was started in 212 patients, but was aborted in 7 patients (3%) with progressive hypotension or hypoxemia after disconnection from the ventilator. In the remaining 205 patients, arterial pH (mean ± SD) decreased from 7.38 ± 0.07 to 7.18 ± 0.07 (p < 0.001), Paco2 increased from 40 ± 5 to 70 ± 9 mm Hg (p < 0.001), and Pao2 decreased from 265 ± 140 mm Hg to 236 ± 155 mm Hg (p < 0.05) (figure 2). In 22 of 205 patients (11%), the pretest Pao2 was borderline and between 70 and 100 mm Hg. Patients with an aborted apnea test had pretest Pao2 values between 70 and 100 mm Hg more often than did patients who completed the apnea test, but the difference was not statistically different (28% vs 8%; Fisher exact test p = 0.12). Brief hypotension (systolic blood pressure between 75 and 90 mm Hg) at the end of a completed apnea test was noted in 14 patients (7%). Hypoxemia (Pao2 between 33 and 60 mm Hg) was documented on the posttest blood gas in 10 patients. Cardiac arrhythmias or cardiac arrest was not observed. None of the patients developed a pneumothorax. Unsuccessful completion of the apnea test was not predicted by pulmonary abnormalities or chest tube placement. Traumatic brain injury in polytrauma patients was significantly more common in patients with aborted or not attempted apnea tests than in patients with completed tests (15/23, 65% vs 59/205, 29%; χ2 test 12.52, p = 0.0004). Circles are group means; error bars represent SD. All differences were statistically significant (p < 0.05). Additional tests (EEG, n = 15; cerebral angiogram, n = 3; nuclear scan, n = 2; transcranial Doppler, n = 3) were confirmatory in patients with aborted apnea tests and in patients in whom the apnea test was deemed unsafe. The possibility of organ procurement was discussed with family members of all patients, and eligibility was determined by LIFESOURCE. The conversion rates were calculated as actual brain death donors/all patients who were declared brain dead. These conversion rates were 81% for 1996–1999, 67% for 2000–2003, and 70% for 2004–2007. There were several new observations in our detailed review of a large series of brain death determinations. First, a majority of patients who succumb to brain death after being admitted to a tertiary center can be declared within 3 days of admission, and even one-third of patients can be declared on the same day. This seemingly trivial finding has important practical implications for patients who may become candidates for organ donation. If clinically likely, physicians should allow patients to progress to brain death after all possible interventions have failed. A practice of early withdrawal of support in these patients limits possibilities for donation, because it could only—after consent—result in tissue retrieval. Even when a “Donation after Cardiac Death” protocol is operational, such a measure will result in fewer transplantable organs per patient. In our series, eight patients could perhaps have been organ donors if further time had been allowed for the patient to fulfill the clinical criteria of brain death. Second, acute hypotension and often polyuria signal the moment of brain death. All patients developed hypotension requiring vasopressors, and a majority required vasopressin for treatment of diabetes insipidus. Hypotension is therefore a defining characteristic of transition to brain death. The high prevalence of diabetes insipidus is primarily related to increased intracranial pressure and brain tissue shift, damaging the hypothalamic–pituitary axis. We found hypernatremia in 40% of the patients, and therefore a considerable proportion of patients were intravascularly volume depleted. Vasopressin and large amounts of fluids are needed to avoid marked dehydration. Third, we may conclude from our study that the apnea test—to passively increase Paco2—is a safe and simple procedure. Typically, apnea testing is performed using the apneic oxygen-diffusion technique. Preoxygenation and oxygen insufflation quickly increases Paco2 (through metabolism), decreases plasma pH and CSF pH, and stimulates the respiratory centers in the medulla oblongata. The apnea test is a fixture in brain death determination, but there is a perceived concern about the safety of the procedure. For appropriate reasons, in 7% of the patients in our series, the examiner decided not to proceed with the apnea test. In 3% of patients, the apnea test was aborted because of hypotension or hypoxemia. This became apparent usually within minutes of commencing the test, and no further complications occurred after the patients were reconnected to the ventilator. Failure to complete the apnea test was expectedly more common in patients with multitrauma prone to hemodynamic instability. Several more patients had brief hypotension or hypoxemia at the completion of the apnea test, but without noticeable clinical consequences. Most importantly, cardiac arrest or pneumothorax from high-flow oxygen insufflation was not observed in 212 apnea tests in our study. These findings are different from our earlier experience in apnea testing. In a prior study, hypotension occurred in 24% of apnea tests, in particular among patients without preoxygenation measures.9 In our study, preoxygenation before the start of the apnea test resulted in marked hyperoxia, and adequate oxygen administration during the procedure likely contributed to the low prevalence of complications. Pulmonary edema, contusions, or pneumothorax may hamper passive transport of oxygen flow across the alveolar–arterial anatomic space, but we were unable to predict the development of oxygen desaturation before the apnea test was initiated. We need to acknowledge limitations in our study. Our study was retrospective, and we may not have accurately appreciated the presence of brief cardiac arrhythmias or blood pressure fluctuations. Nonetheless, we had access to clinical data, including vital signs measured with intervals no longer than 5 minutes. With our case identification method, we may have excluded polytrauma patients who—if tested systematically—could have fulfilled the criteria of brain death, but were not registered because of irreversible shock and early cardiac arrest. The declaration of brain death occurs under complex circumstances. Patients not only require a high level of ventilatory support, but also are supported by both vasopressors and vasopressin to ensure adequate arterial pressure and renal function. Only if oxygenation is maintained can absent breathing drive be safely assessed. Failure to complete the apnea test cannot be predicted, but is uncommon when an oxygen-diffusion technique is used. Received April 23, 2008. Accepted in final form June 26, 2008. Senouci K, Guerrini P, Diene E, et al. A survey on patients admitted in severe coma: implications for brain death identification and organ donation. Intensive Care Med 2004;30:38–44. Bustos JL, Surt K, Soratti C. Glasgow coma scale 7 or less surveillance program for brain death identification in Argentina: epidemiology and outcome. Transplant Proc 2006;38:3697–3699. Kompagne EJO, Bakker J, Slieker FJ, et al. Organ donations and unused potential donations in traumatic brain injury, subarachnoid hemorrhage and intracerebral hemorrhage. Intensive Care Med 2006;32:217–222. Practice parameters for determining brain death in adults (summary statement): report of the Quality Standards Subcommittee of the American Academy of Neurology. Neurology 1995;45:1012–1014. Sasposnik G, Maurino J, Saizar R, et al. Spontaneous and reflex movements in 107 patients with brain death Am J Med 2005;118:311–314. De Freitas GR, André C. Absence of the Babinski sign in brain death: a prospective study of 144 cases. J Neurol 2005;252:106–107. Ruiz-Garcia M, Gonzalez-Astiazarán A, Collado-Corana MA, et al. Brain death in children: clinical, neurophysiological and radioisotopic angiography findings in 125 patients. Childs Nerv Syst 2000;16:40–45. Wijdicks EFM. The diagnosis of brain death. N Engl J Med 2001;344:1215–1221. Goudreau JL, Wijdicks EFM, Emery SF. Complications during apnea testing in the determination of brain death: predisposing factors. Neurology 2000;10:55:1045–1048. Helms AK, Torbey MT, Hacein-Bey L, et al. Standardized protocols increase organ and tissue donation rates in the neurocritical care unit. Neurology 2004;63:1955–1957. Rodrigue JR, Cornell DL, Howard RJ. Organ donation decision: comparison of donor and non donor families. Am J Transplant 2006;6:190–198.